UTSC's active Faculty can request a free 100 GB Nextcloud account through the IITS HelpDesk. For users seeking larger capacities, please reach out to the HelpDesk to discuss options. This service is designed for active UTSC Faculty. Staff should seek alternative solutions through the IITS HelpDesk. UTSC Faculty who would like to use Nextcloud should request the service through the IITS HelpDesk. The Nextcloud sync client is compatible with Microsoft Windows (7, 8.x, and 10), and Mac OSX (10.9+). Linux users will be required to compile their own installer from source code. For smartphones and tablets, the Nextcloud app is available on both the Google Play and iTunes App stores at no cost. After requesting the service from the IITS Staff and Faculty Helpdesk, you can proceed to install and configure the software client. During the software installation, you will be prompted for the server location and credentials. 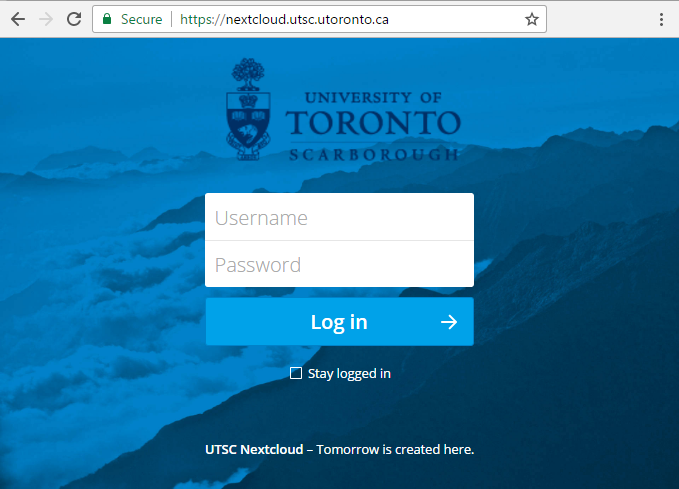 Alternativly, you can access the web portal for Nextcloud at nextcloud.utsc.utoronto.ca.